ELLENTON, Fla., (Nov. 13, 2018) – Feld Entertainment, Inc., announced today that registration is now open for Supercross Futures, an AMA National Championship, at supercrossfutures.com. The newly-formed Supercross Futures series will feature the fastest up-and-coming talent of all ages and skill levels in eight races starting in Glendale on January 13 at State Farm Stadium. Following Saturday’s professional event at Monster Energy AMA Supercross, an FIM World Championship, hundreds of young athletes will compete inside the same stadium as their heroes did the night before on a track that is raceable for all skill levels. Click the image below to view the Supercross Futures Registration video. Throughout the season, which travels from Glendale to Anaheim and Oakland before moving East to Indianapolis and continuing to Houston, Nashville and Denver ahead of the season finale in Las Vegas, competitors will also be eligible for contingency through programs such as Toyota Moto Money and Rocky Mountain ATV/MC Race Gas Cash. For Toyota owners who participate in Supercross Futures through the Toyota Moto Money program, which opens November 13, participants will be eligible for $1.3 Million in contingency awards with one of six 2010 or newer qualifying Toyota models: Tacoma, Tundra, Sequoia, 4Runner, RAV4 and Highlander. Additionally, participants who register for a Supercross Futures event will also receive a $10 Rocky Mountain ATV/MC gift card via email, which can be used on RockyMountainATVMC.com. Stay tuned to supercrossfutures.com for further contingency news and program announcements. 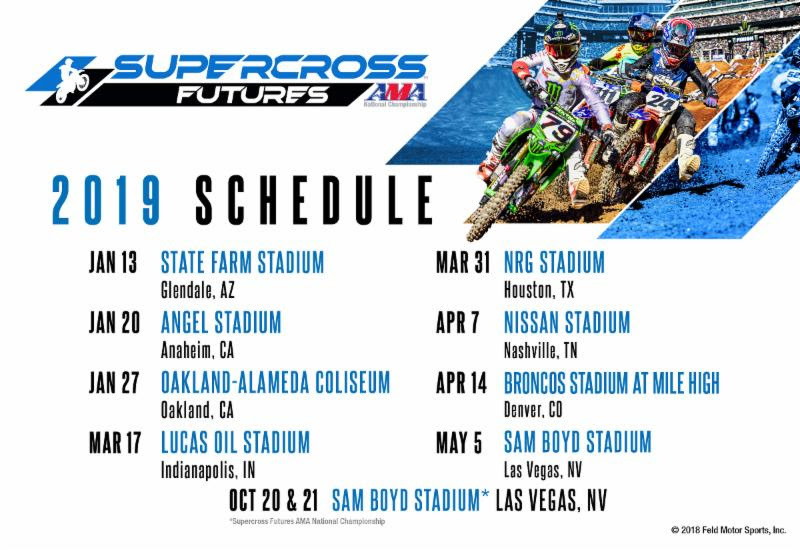 Anticipated Supercross Futures athletes include the 2018 Monster Energy Cup Amateur All-Star Class winner, Jo Shimoda, this year’s Supermini Class winner, Max Vohland, along with previous event winners, Stilez Robertson (Supermini, 2016) and Lance Kobusch (Supermini, 2015). Female competitors such as Jordan Jarvis and Jazzmyn Canfield will be among the 6,100 athletes expected to participate across 26 classes beginning with 4-year-olds in the 51 Limited Class through the elite 250SX Futures Class while providing greater access to the sport’s largest stage. The eight-race series will culminate in an AMA National Championship in Las Vegas on October 20-21, 2019, following the 2019 Monster Energy Cup, the sport’s marquee event surrounded by the spectacle of Las Vegas. The series allows athletes the opportunity to earn Road to Supercross points toward their professional AMA Supercross license. Supercross Futures, an AMA National Championship, is the official advancement platform of Monster Energy AMA Supercross, an FIM World Championship. The new series provides the world’s fastest up-and-coming talent a chance to compete in the same stadium and on the same dirt as the elite athletes of Monster Energy Supercross while honing their skills in advance of their professional careers. With eight individual races taking place on Sunday in 2019, the ground-breaking concept will develop approximately 6,100 athletes across 26 classes inside the same stadiums and on the same dirt as the professionals – beginning with 4-year-olds in the 51 Limited class, through the elite 250SX Futures class, providing athletes the opportunity to earn their 250SX Class Supercross license through the Road to Supercross. Visit supercrossfutures.com for more information.